The Beseler Negaflat is a unique alternative to 4x5 glass carriers. By gripping the edges of the negative on opposite sides, it pulls the negative taut, holding it flat without glass. 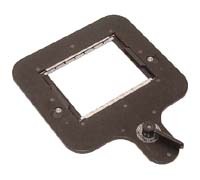 The Negaflat can be used with all Beseler 4x5 enlargers, and on Omega D-series enlargers with an adapter plate. These Negaflat carriers are used and have minor cosmetic marks from previous use, but are certified to be in perfect working condition.